Niagara-on-the-Lake, Ontario isn’t exactly WNY, but you can almost see it from here! 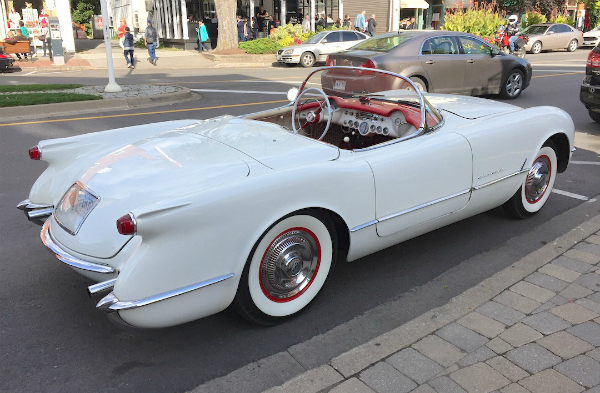 Our friend David Lundy was up there recently and snapped this 1955 Chevrolet Corvette with his smart phone. It’s very rare to see one of these early ‘Vettes (300, 3,650, and 700 produced respectively from 1953-55) — even more rare to see one parked on the street! The ’53-’55 models shared the same body style, but you can tell this one’s a ’55 from that stick shift poking up between the seats; the first two years’ cars all came with a two-speed Powerglide automatic. Thanks again, Dave. Jim Corbran, RRofWNY …and check out our Facebook page: Non-American Classic Cars The post RealRides of WNY appeared first on Buffalo Cars.